I did something a little outside of my comfort zone and joined an Instagram Mini Swap! Schnizel and Boo’s, to be precise. 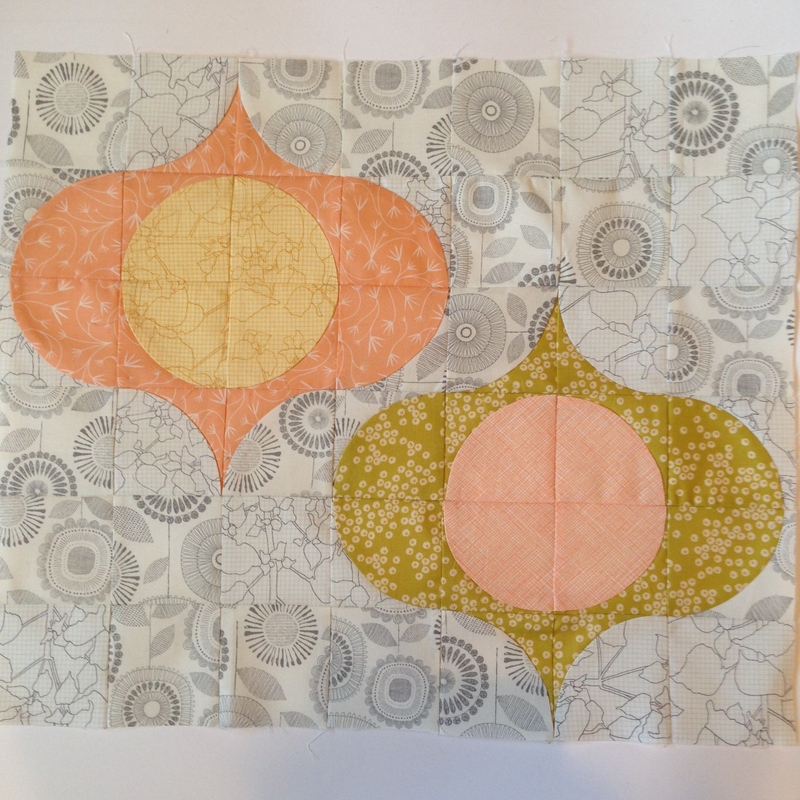 I thought it would make a fun blog post to show my progress shots as documentation of the entire quilting process. My partner likes low volume and pretty florals, so I decided to pull some favorite low-volume prints that feature gray. They would contrast nicely with the peach and yellow florals that I chose to feature. The final pull was slightly different than this stack. The grid, crosshatch and succulent prints are from Carolyn Friedlander. The large gray floral is Eloise Renouf for Cloud 9. The gold with tiny flowers is from the appropriately named Petit Fleurs collection, and the peach is from Elizabeth Olwen for Cloud 9 Fabrics. Next up was cutting and block assembly. I decided to do quarter-circle blocks for a mini Trill design (I’m a little obsessed with that shape at the moment), so I laid them out and glue basted the blocks four at a time. Top assembly. Part of the appeal of mini quilts for me is that they encourage a level of detail that would just be too overwhelming on a large quilt. I usually press to one side to help nest seams to make rows and then press them to one side again to save time. But open was possible and looked great, so open it was. The next step was quilting. 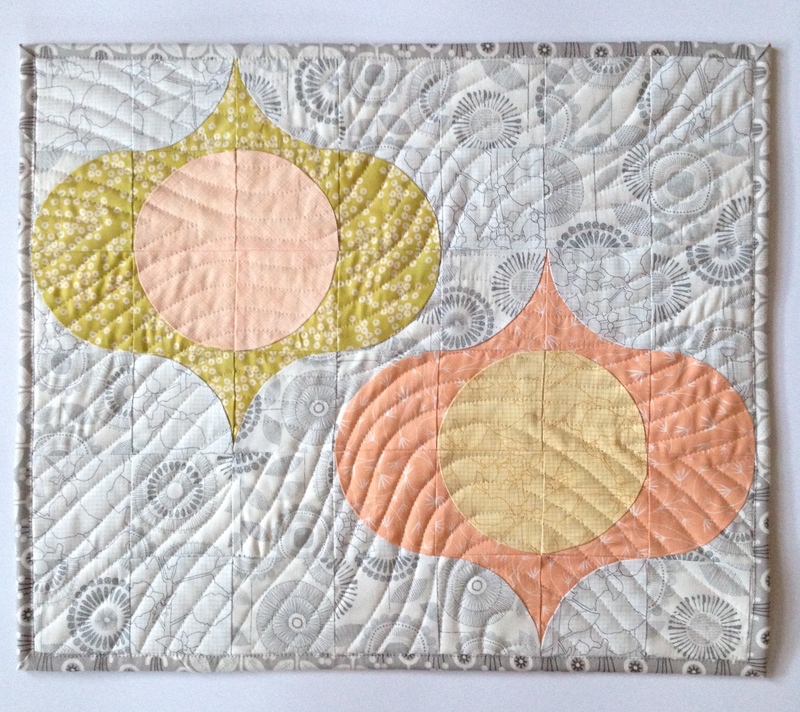 I added texture with my favorite wavy walking foot quilting. This is the back, with another Elizabeth Olwen fabric, from her Grey Abbey collection. And the back. I put some pockets in for easy hanging. I don’t think my partner reads this site, but just in case I won’t reveal who the recipient is until she gets it. It goes out Monday morning with a few little treats. NJMQG will be having a mini quilt swap in February. Have you swapped before? What do you do with the quilts you receive? 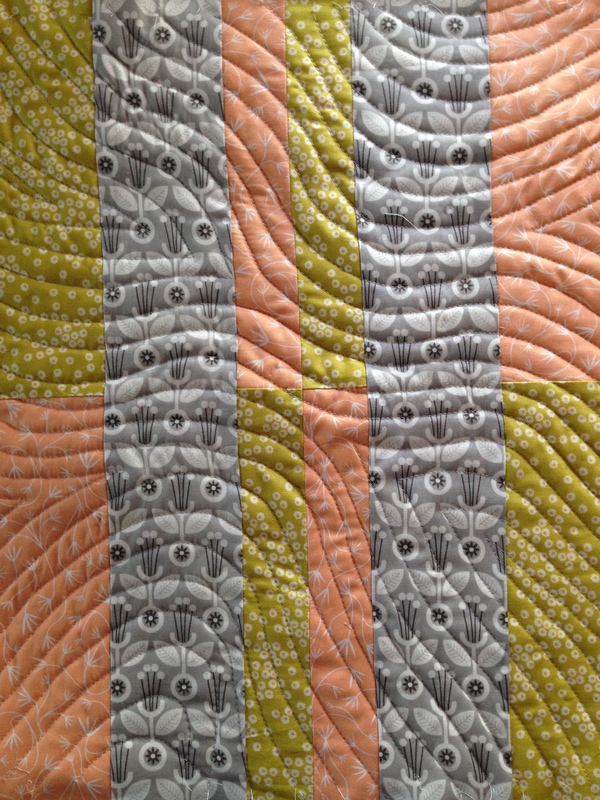 Lovely fabric, beautiful piecing and awesome quilting. She’s bound to love it. I hope you get something just as fabulous in return. Thank you, Kate! 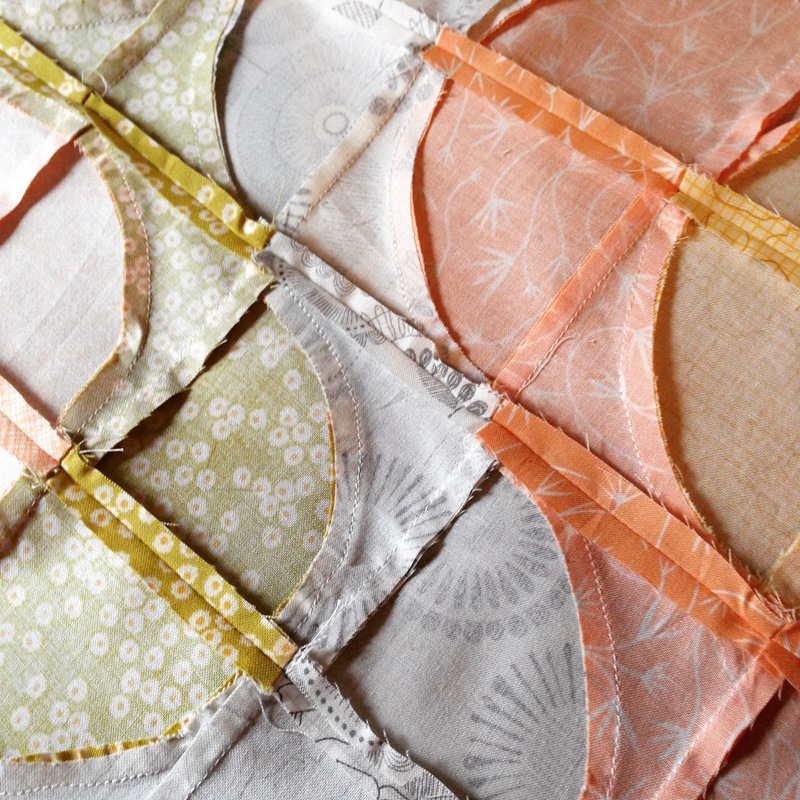 I love how the intention and attention to detail come together in a mini quilt swap. Everything about this is spectacular. I love how those background prints work together! Wow. Really pretty! The swaps I’ve been …well, it depends on what I got. One is currently the cat’s bed, two are in a box, one I bring to guild meetings as an example, and one is hung prominently where I can see it every day. So it kind of runs the gamut. 😀 I hope you get one as awesome as the one you made!!!! The mini is beautiful! 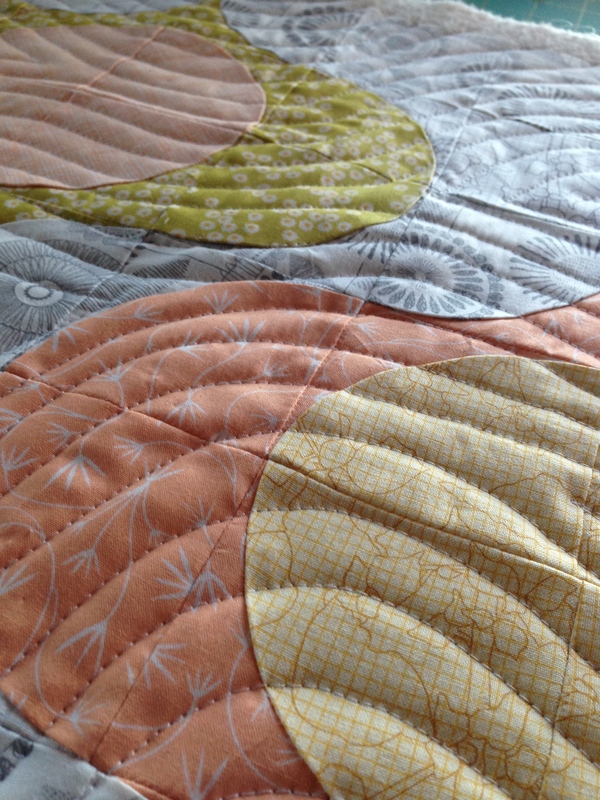 The interplay of the curved piecing and positioning is great, and I hope your swap partner loves it. Thanks, Yvonne! I was worried about the layout, and I’m happy with how it turned out too. I love your choice of fabric and your design. Question….what kind of machine do you use for your walking foot quilting. I sew on a Janome 6500. Was wondering about it, because I do a lot of walking foot quilting myself. But I am intrigued with your shapely curves. Thank you, Mardis! I sew on a Janome 6600, and I LOVE the Accufeed feet. Like, inappropriately. Curves aren’t hard– you just have to move the fabric around a bit. Much easier on mini quilts, but fun to play with. Beautiful Mel! I love the curvy blocks. Something I want to try soon! Thanks, Kari! It just takes a little courage– if you’ve made a bag or a garment, you can sew curves! This is so elegant. Well done! I love it! The colors are so soft, but interesting at the same time. Well done!